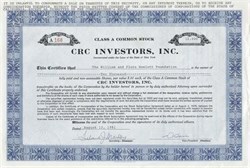 Beautifully engraved certificate from CRC Investors, Inc. issued in 1981. This historic document was printed by Hasbrouck-Thistle & Company and has an ornate border around it. This item is hand signed by the Company's Vice-President and Secretary and is over 23 years old. The certificate was issued to the William and Flora Hewlett Foundation. With David Packard, William R. (Bill) Hewlett was co-founder of Hewlett-Packard Company. Hewlett resigned as president in 1977 and retired as chief executive officer in 1978 in accordance with his previously announced plans for management succession within HP. He then served as chairman of HP's executive committee until 1983, when he became vice chairman of the HP board of directors.